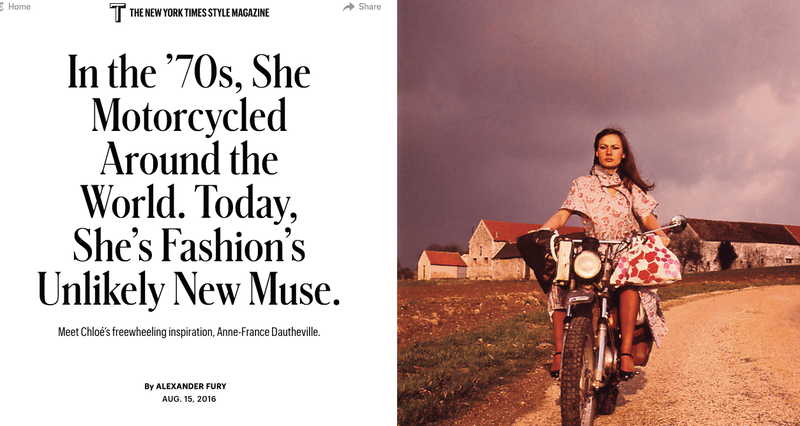 In the latest issue of T Magazine, fashion critic Alexander Fury profiled Anne-France Dautheville, the 72-year-old French journalist who, in the ‘70s and ‘80s, rode a motorcycle from Paris to Afghanistan and then across the world—the first woman to do so—before writing Une demoiselle sur une moto, a memoir of her journeys. For the fashion house Chloé, she proved a fitting muse for its Fall 2016 collection, “tying Chloé’s ’70s silhouette—skinny torso, high waists, flares and platform shoes—to a new spirit of female independence, epitomized by her travels,” writes Fury. Dautheville’s rugged cool resonated with Chloé’s creative director, Clare Waight Keller, who approached the modest writer as inspiration. After that visit, it became even clearer that Dautheville perfectly aligned with Chloé’s history of strong heroines: the women who have inspired the clothes which, as Waight Keller emphasizes, are shorn of any visible logo, as well as the previous designers behind them, from Martine Sitbon to Stella McCartney. Waight Keller cites ongoing inspirations, such as Charlotte Rampling or Jane Birkin, ­“the obvious ones, who­ if you asked people on the street who they’d say was a ‘Chloé Girl.’ ” Dautheville fits in perfectly, albeit with slightly less everyman recognition. Fury links the freedom and independence of Dautheville with the clothes—not the way they’re inspired by her old photos, tooling around the flat earth looking as cool as could be, but also the way such tough “personality,” as Waight Keller puts it, can be embodied through osmosis, that artistic spirit emerging through leather pants and tough trenches and non-constricting gowns. Most importantly, though, now we’ve got a whole host of new books to read. Read the full T Magazine piece here.